One of these incidents was the Waschi Uprising, which took place a few decades ago in the Kamokor system. Then, a few radical Caldari attacked settlements of Intakis in the system and proclaimed that the Caldari State was solely for people of Caldari origin. The Caldari authority, as ever fearful that their finely woven social tapestry of corporatism would be torn asunder, sent in their best military units to quell the uprising before it could spread any further. The Waschi Uprising did not leave any permanent marks on Caldari society. Still, it did leave one legacy that has carried on to this very day and that is Mordu’s Legion. When the Caldari broke from the Gallente Federation many Intakis that sympathized with their cause were exiled from the Federation. The most militant of those went over to the Caldari and asked to join them in their fight against the Federation. These were all experienced military personnel and thus very valuable in the early stages of the war when veterans were few and far between. The Intakis were all put into a separate squadron, with a Caldari officer. His name was Muryia Mordu. Mordu was a brilliant young officer and one of the more open-minded Caldari, who generally are extremely xenophobic. He immediately took to the Intakis and they to him and together they formed one of the more revered fighting units in the Caldari Navy during the war with the Federation. After the war ended the Intakis were offered cheap land and accommodations in Waschi City on the planet of Kamokor IV. For awhile the Intakis lived peacefully, slowly becoming part of the Waschi community. Yet the presence of the Intakis caused tension in the city and slowly radicals, feeding on the xenophobic tendencies of the Caldari, gained strength. In the end the radicals gained majority in the city and began seriously harassing the Intakis. When Caldari authorities tried to put an end to this the uprising started in earnest, with the radicals and their supporters demanding the exportation of all foreigners and the closure of the borders. The Intakis were driven out and, in desperation, they called on their old commander Mordu to help them defend themselves and get back what was rightfully theirs. Mordu, now retired, agreed to assist. The catch was that Mordu and the Intakis were no longer part of the Caldari Navy. Not deterred by this small fact, the group formed an independent mercenary corps to fight the radicals. This was the inception of Mordu’s Legion. The Legion, mostly consisting of old veterans from the war with the Federation and young hotheads eager for action, helped the Caldari Navy to tear the radicals’ forces to pieces under the skillful direction of Mordu. The Caldari authorities were impressed by the fighting spirit of the Legion and offered to merge it with the Caldari Navy. Mordu and the other leaders of the Legion declined, deciding rather to focus on the mercenary nature of the Legion. In the years since the uprising Mordu’s Legion has grown in stature. 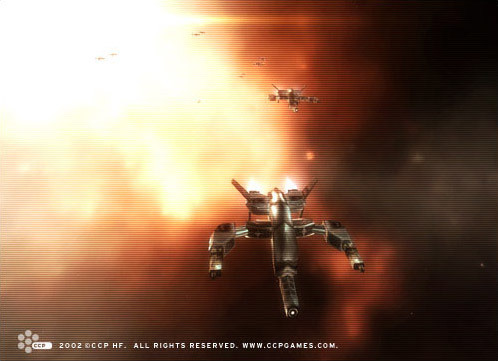 Today it is the largest and most famous mercenary corps in the world of EVE. The Legion has always had close ties with the Caldari State and the two assist each other on many issues. At first the Legion accepted only citizens of the Caldari State, but today they accept members from any race, as long as they are not known enemies of the Caldari State. Still, the majority of the members are of Caldari origin and the leaders are all Caldari. The Legion does not train its members, so they are expected to be experienced fighters before they apply for membership in the Legion. Members of the Legion get access to high-tech Caldari military equipment, even prototype weapons to test out, and are guaranteed plenty of employment if they so wish. Non-Caldari that have served in the Legion for a long time are offered Caldari citizenship on their retirement. The Legion is often employed by governments to settle issues that are not directly under anyone’s jurisdiction, especially when fast deployment and swift results are needed. Their reputation as combat experts as well as fair and honest warriors has never been tarnished.